Storage capacity: about 1,540 pallets. 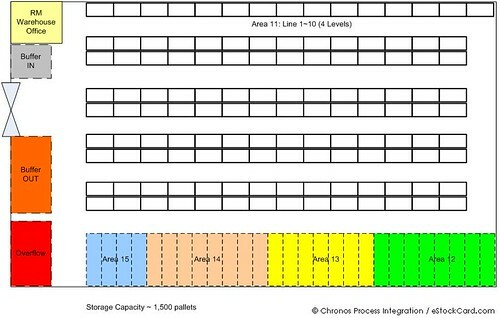 Different color zone represent storage of different products (in terms of properties, packaging etc). Very messy and goods are being stored anywhere with space available. 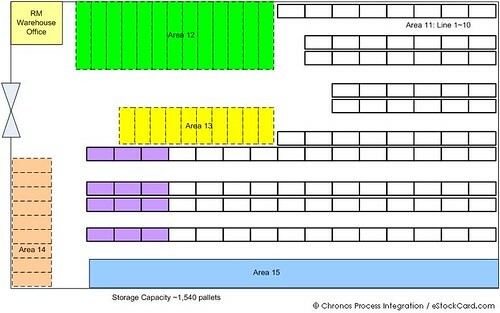 Similar product being stored at different zones due to unbalance of storage space being allocated. Operator has to search multiple areas in order to get the right item. No access at the end of each storage row (Dead-end) — it only allows ONE-way access. Forklift driver unable to cross to next row easily if he couldn’t find the right product within the same row. Operator always pick the goods near to the office (shorter distance and more turning space). Poor First In First Out (FIFO) practice — causing high over shelf-life problem. No specific area for goods receiving and delivery respectively which resulted in high delivery mistake and poor inventory accuracy etc. Storage capacity: about 1,500 pallets. To clearly segregate the storage zones based on nature of packing/property/size/weight. Provide access from both sides of the storage racking row. Forklift driver can drive freely along the racking row to pick the right item. Specific area for Receiving and Delivery respectively. No mixed up. Inventory accuracy improved tremendously etc. Obviously, a proper planned layout for warehouse is crucial towards better inventory control and management. It improves productivity, accuracy, and more important is, operators work easier. Please refer to the Inventory Management Software Case Studies page for more examples.